Preheat oven to 350º F. Grease 13x9-inch baking sheet (or line with foil). In a large bowl combine the first eight ingredients, through garlic. Add ground beef, mix well. Shape mixture into four round loaves and place on one half of the baking sheet. In a small bowl combine the ketchup, brown sugar and yellow mustard; spread over meatloaves. Wash and dry large bowl. Combine the potato seasoning ingredients. Toss to coat. Place in the other half of the prepared pan. 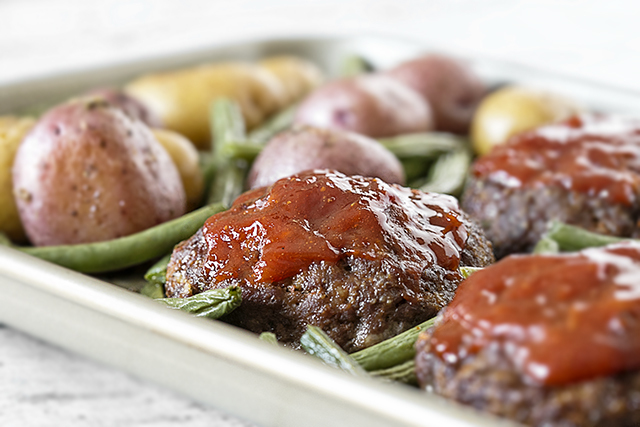 Bake 40-45 minutes or until meatloaves are done and potatoes are tender. Add green beans after 20 minutes.